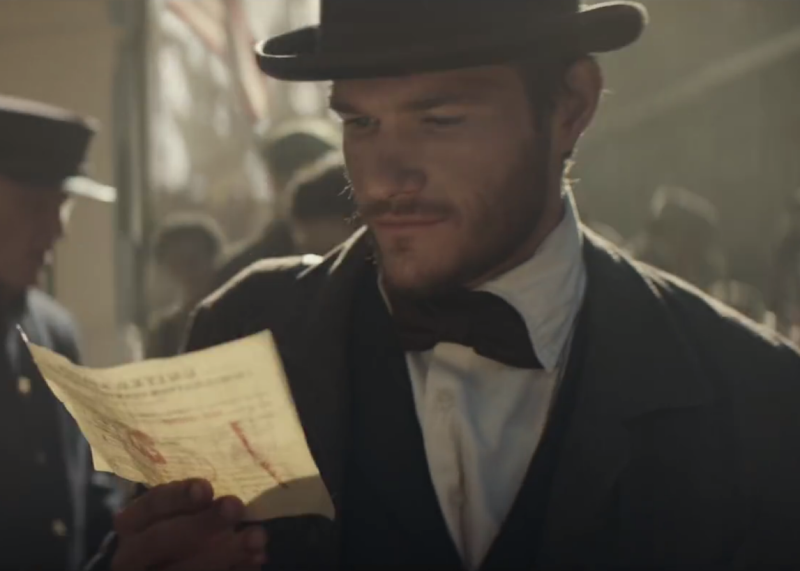 Budweiser's Super Bowl ad casts Adolphus Busch as an immigrant success story (VIDEO). Budweiser’s Super Bowl Ad Tells a Compelling Immigrant Story. It’s Just Not Adolphus Busch’s. Adolphus Busch arrives in the new world. Budweiser’s 60-second Super Bowl spot, “Born the Hard Way,” which depicts the arduous journey of Anheuser-Busch’s co-founder from Germany to St. Louis, was hailed as a powerful pro-immigration statement from the instant it hit the internet on Monday. The ad, which was directed by Chris Sargent, shows Adolphus Busch crossing the Atlantic in a storm-tossed ship, being taunted as he makes landfall in New Orleans, and boarding a steamship up the Mississippi, which promptly catches fire, eventually ending up in a bar where he meets a man who introduces himself as Eberhard Anheuser. With angry-faced men yelling “You’re not wanted here!” and “Go back home!” at Busch as he takes his first steps in the new world, the ad dovetailed neatly with the heated emotions stirred up Donald Trump’s Muslim ban—perfect timing, even though the commercial had been in the works for over eight months. But did the brewing giant that renamed its flagship product “America” in the middle of a presidential campaign really intend to take such a potentially divisive political stand? And just how representative of the immigrant experience is Adolphus Busch, anyway? An Ad Week account of the production says “Born the Hard Way” is “as historically accurate as it can be,” but the article is strangely mute on the particulars of Busch’s story: It’s a nice touch that “props like Adolphus’ notebook and bow tie” are “true to the time,” but that doesn’t exactly vouch for the way the ad represents Busch’s story itself. So we asked William Knoedelseder, the author of Bitter Brew: The Rise and Fall of Anheuser-Busch and America’s Kings of Beer, how much of the much-touted Super Bowl spot is true to life and how much is just foam. The interview has been edited and condensed for clarity. Did Adolphus come to the U.S. to become a brewer? Adolphus wasn’t a brewer. He came to find his fortune. He didn’t like beer. He was a wine drinker. But he came from a wine merchant family. But I would always respond to the people who would turn their nose up when I mention Budweiser: The story of the Anheuser-Busch is the absolute success story of craft beer. When they started out, there was nothing but craft brewers. There was 40 of them in St. Louis. They made beer on their block, and they sold it as far as the wagon could carry the beer. And he became a global colossus. It’s an amazing American immigrant success story. So do you think there was any political intent in releasing an ad with an immigration theme? I think they were just building on a whole history they have of playing upon their heritage. That’s always been a strong suit for them in selling the beer. It just happened to come out this week in the middle of this immigration stuff. If it had come out last year, it just would have been a very good Anheuser-Busch commercial that got written up in Ad Age and might have won an award. I was just listening to NPR, and they’re discussing whether it’s a good thing that a company takes a side in a political issue using this ad. It’s laughable. The approval process for an ad campaign for the first slot in the Super Bowl is a very lengthy one, and the last position that Anheuser-Busch would want to take would be what these people are suggesting in this discussion—the left-hand side. It’s at best coincidental, I think.